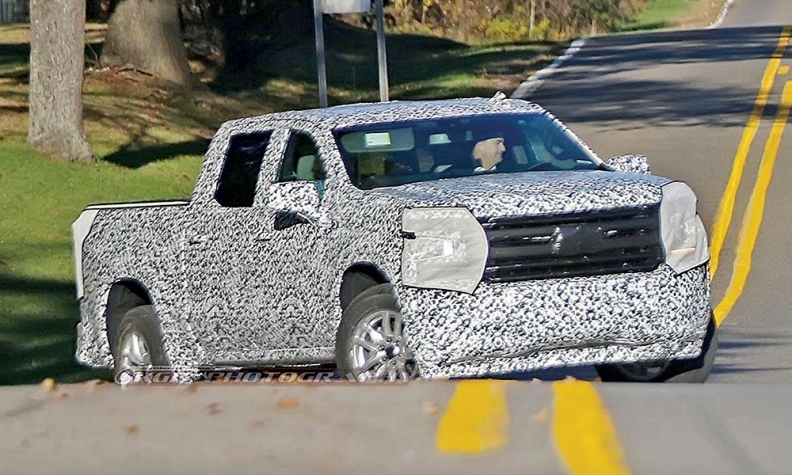 GM is expected to eventually offer carbon fibre beds in its Chevy Silverado, shown in a spy shot. DETROIT — General Motors is expected to make revolutionary changes to the makeup of its next-generation pickups to better position them against Ford Motor Co.'s market-leading trucks and accelerate its progress toward stricter federal fuel economy standards. Two sources familiar with the company's plans confirmed GM will offer carbon fibre for the beds of the pickups. It would be the largest-scale automotive application of the light-weight, high-strength material, whose long, labour-intensive production process and high cost relative to steel and aluminum have limited its use mostly to luxury vehicles and sports cars. Carbon fibre, according to one source, is expected to be used as part of a mix of materials for the box of the pickups, including aluminum. The truck beds could mark GM's first use of carbon fibre-reinforced thermoplastic, a product the automaker announced it was co-developing with Japan-based Teijin Ltd. in 2011. "This is a long-term bet for keeping the pickup truck relevant," said Dave Sullivan, an analyst at AutoPacific. "There is nothing lighter or stronger than carbon fibre that could do duty in a truck." The carbon fibre bed is expected to be among a significant number of changes in materials for the Chevrolet Silverado and GMC Sierra pickups to meet progressively stricter fuel economy regulations. It's also meant for GM to keep or improve its position against Ram and Ford, which shifted its F-series pickups, including the full-size F-150, to light-weight aluminum alloy bodies in 2014. "Ford has proved people are willing to consider and buy something other than steel," Sullivan said. GM's ads for its current pickups have tweaked Ford by casting doubt about the strength of aluminum in its beds. A GM spokesman declined to comment on the next-generation pickups. He reiterated the company's strategy on new and redesigned products using "the right materials in the right place" to reduce weight "without any sacrifice of safety, ride dynamics or utility." The next-generation Silverado and Sierra are expected to be unveiled soon and go on sale next year, without the carbon fibre beds. GM is expected to begin offering the carbon fibre beds within the next two years, according to The Wall Street Journal, which reported the change last week. The Journal said the carbon fibre beds would go in premium versions of the pickups, but more efficient production processes could help the automaker eventually offer them in lower trims. It was unclear how much the carbon fibre would add to the price of the trucks. GM's sourcing plans for the carbon fibre aren't clear either. In late 2016, GM partner Teijin announced plans to develop a carbon fibre production facility in Greenwood, S.C., for both automotive and aircraft applications. The company said last month that the new plant would be in operation by mid-2021. A Teijin spokeswoman confirmed the facility will produce carbon fibre first for aerospace applications, followed by automotive. She declined to comment on whether the production is related to its partnership with GM on the carbon fibre-reinforced thermoplastic. Teijin, according to its website, has developed the world's "first mass-production technology for carbon fibre-reinforced thermoplastic." The company says the technology — named Sereebo — can mold the carbon fibre-reinforced thermoplastic in less than a minute — a milestone in cutting carbon fibre costs. Traditional carbon fibre-reinforced plastics can take several minutes or even hours to mold into a desired shape, according to Teijin. "That's the key," said Richard Schultz, materials director and adviser for consulting firm Ducker Worldwide. Schultz said carbon fibre-reinforced thermoplastic could work well as a pickup bed when used with other materials such as aluminum. He said it's likely a high-density use, which is less expensive than low-density carbon fibre compounds used by some automakers such as BMW. Teijin, according to the spokeswoman, has joint development projects for carbon fibre-reinforced thermoplastics with "several automakers." She confirmed Teijin received a material certification from GM in 2014 for the material and "development is coming along." A GM spokesman confirmed the automaker still has a "relationship" with Teijin, but declined to elaborate on details of the partnership.